By outrunning a X-ray laser’s path of destruction, an international research team has created 3D images of fragile but biologically important molecules inside protein nanocrystals. Using the Linac Coherence Light Source (LCLS), a powerful at the SLAC National Accelerator Laboratory in Menlo Park, Calif., the scientists fired femtosecond (one quadrillionth of a second) bursts of light at a stream of tumbling molecules, obliterating them as they passed — but not before capturing otherwise illusive images of their crystalline structures. “These laser pulses are so brief that we are able to outrun the radiation’s damaging effects,” said John C. H. Spence of Arizona State University, one of more than 70 international researchers from institutions including SLAC; DESY, the German Electron Synchrotron; and the Max-Planck Institute in Heidelberg, Germany. o obtain this information, the crystal is frozen, to reduce radiation damage, and placed on a rotating mount and bombarded with X-rays as its orientation is changed. A scattering pattern is slowly built up and the 3D structure can eventually be deduced. But the freezing prevents observation of the molecules in their native liquid environment at room temperature. To obtain images of these molecules in the more natural state, the researchers sent the protein nanocrystals streaming in a single-file micron-sized droplet beam (rather like an ink-jet printer) in vacuum across the X-ray beam, in a method developed at Arizona State University. Next they fired incredibly brief bursts of X-ray laser light, about 100 times each second, at the molecules in the droplet beam, and detected the scattered X-ray patterns from each particle before the intensity of the beam blasted them apart. The researchers were able to combine these millions of snapshots to build up 3D models of the molecules with atomic-scale resolution. One particular molecule that was studied this way was Photosystem 1-ferredoxin, which is the chemical powerhouse that drives photosynthesis. The molecules for this experiment were made in the laboratory of Arizona State University researcher Petra Fromme. Photosystem 1 harnesses sunlight to split water to make the oxygen we breathe, absorb carbon dioxide, and produce sugars, which maintains our biosphere. These molecules were studied “in action” by exciting them with a pulse of green laser light (to mimic the effect of sunlight falling on a leaf) a few microseconds before taking their X-ray snapshot. Each snapshot then became one frame of a movie. By changing the delay between green pulse and X-ray pulse, the researchers could create a 3D movie of a biomolecule in action. An overview and early results of this new imaging technique will be presented at the 2012 meeting of the American Crystallographic Association (ACA), which takes place July 28 — Aug. 1 in Boston, Mass. 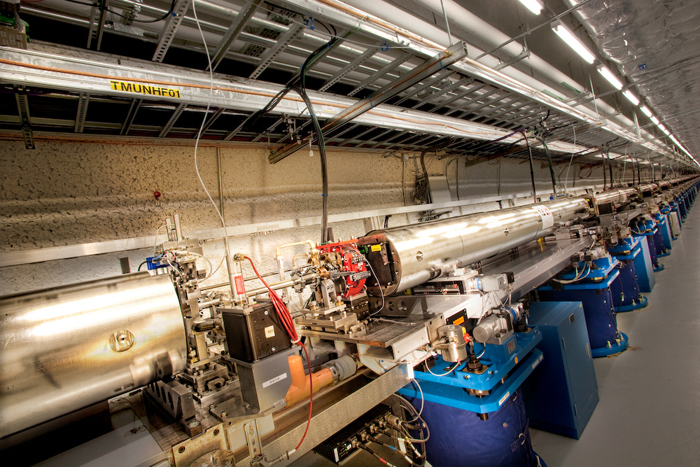 PULSE Institute and SLAC National Accelerator Laboratory, Menlo Park, Calif.